Cedar-paneled rooms with an Art Deco flair and our personal warmth of welcome may explain why so many guests return year after year to the lush gardens of our family-operated motel. We invite you to view the many room photos provided by our guests on Trip Advisor and Yelp. 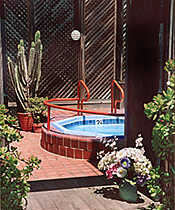 Our guests enjoy the seclusion of our garden hot tub, come rain or shine! We have two gardens (one with a play structure for small children) and invite both couples and their families to relax after a whirl of downtown attractions. Sometimes, guests even say they can hear the foghorns and ocean waves in the quiet hours after midnight. Fully-equipped kitchen units are available in some rooms — and all rooms with more than one queen include a microwave and fridge. Our rooms are non-smoking and include a private bathroom with shower and hairdryer, filter coffeemaker, free WiFi, and HBO/cable TV. Java Beach cafe is just steps away for breakfast and light meals. We do not accept cats due to guest allergies, but dogs are welcome. They may not be left alone in the rooms, and except for service animals, there is a daily pet fee. The garden courtyard is surrounded by our smaller rooms, some with kitchens. The motel also has larger, two-bedroom family suites with two and three queen-size beds, with either microwave and fridge, or with kitchens. Unlike downtown hotels, we offer free local phone calls and free off-street parking on a space-available basis. 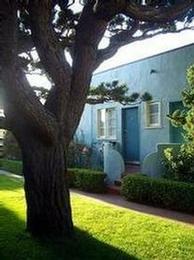 Keeping in mind that the Ocean Park opened in 1937, the accommodations are small by today's standards. Fully-equipped kitchens are $15-20 extra with a three-day minimum stay, or on a space-available basis. All rooms with two beds or more include a gratis microwave and fridge. Rates are subject to change without notice and are guaranteed after receipt of a credit card number to secure the reservation. Peak-season rates and minimum night stays apply to high volume events and holiday periods. Contact us for more information or if you have any questions at all.